The AML ez1073-500 is a Class A, mic pre-amp, line amp and EQ/Filter module which occupies two slots in a 500 series rack. Fully populated with Carnhill transformers and inductors to achieve its distinctive classic sound, this high-end hand-built British module provides an affordable solution for the modern cost conscious studio. 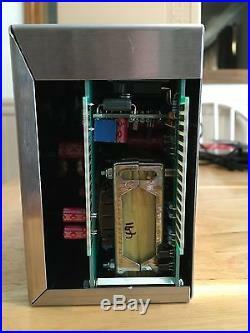 Classic 3 stage (Class A) amplifier design. All discrete component (no surface mount devices). Entirely hand assembled and tested in the England to exacting quality standards. Mic Input: Carnhill transformer balanced (Classic VTB9045) +10dB to +65dB gain, rotary switchable in 5dB steps and switchable 300/1200 Ohm impedance input. Line Input: Carnhill transformer balanced (Classic VTB9046) - 20dB to +20dB, rotary switchable in 4dB steps (centre 0dB), 10k Input Impedance. Line Output: Carnhill transformer balanced (Classic full size output transformer). EQ/Filter Stage: 3 inductor (Class A) amplifier design. HF (12kHz) +/- 16dB gain continuously variable. MF (switchable; 360Hz, 700Hz, 1.6kHz, 3.2kHz, 4.8kHz & 7.2kHz) +/- 16dB gain continuously variable. 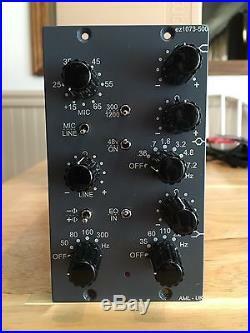 LF (switchable; 35Hz, 60Hz, 110Hz & 220Hz) +/- 16dB gain continuously variable. Low Pass Filter (switchable; 50Hz, 80Hz, 160Hz & 300Hz) -18dB per Octave. The XLR behind the left hand side is the Mic Input. The XLR behind the right hand side is the Line Input. The output is duplicated on both of the output XLRs. Total current consumption 110mA (per unit). For use in API (and compatible) Lunchbox and VPR500 racking systems. The item "AML EZ1073" is in sale since Wednesday, September 07, 2016. This item is in the category "Musical Instruments & Gear\Pro Audio Equipment\Preamps & Channel Strips". The seller is "drathgeb120" and is located in Irwin, Pennsylvania.